I'm gonna use my fame and money to make the world a better place...OK? Life is seriously good for Sassy Wilde - she's had her first kiss, she has the two bestest bezzies ever and her rock-chick dreams are on the verge of coming true. But just as everything's set to take off, her new boyfriend starts acting weird - and then the record company turns Sassy's world upside down! Thirteen year old Sassy Wilde lives for music, and cares for the environment a lot. Then, recording company Y-Generation, manages to turn her world upside down. She gives up and gives her treasured guitar to charity. But then REAL disaster strikes, and everyone is counting on Sassy to help...will she sing, or not? Raising money for terrible earthquake in Pakistan by singing, which will always be her favourite hobbie....how can she resist?! Sassy Wilde is seriously sassy - she knows how to live up to her name. This. Cover. Is. Absolutely. GORGEOUS! I love all the doodles on it, it's just so unique and eye-catching. It's crazy but somehow it all fits together! I think this novel is brilliant, because it's about the environment and music. It will make children and teens more aware of global warming, and mixed with music....it's the perfect match, isn't it? All teenagers love music, so they're definitely going to listen to this story's message. The characters are realistic and well thought about. Maggi is such a fantastic writer, and she has done brilliantly in getting into a teenagers head. My favourite character has to be Sassy. She's so down to earth and she cares about the environment. I think she's a really cool character so she's definitely my favourite. This novel gets a rating of 5/5 from me! I recommend it to readers aged 10+ - everyone will enjoy it. Maggi, you've done an amazing job on writing the Seriously Sassy books - I hope there are many more to come! Thank you a billion, trillion times to Puffin for sending me this amazingly sassy book. Notes: If you would like to know more about the characters, or see what Sassy and Maggi are up to, click HERE. You can buy this book HERE. Thanks for the GREAT review! 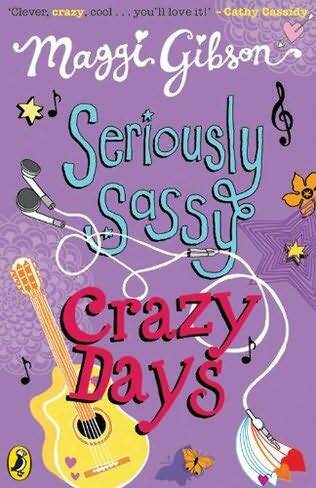 I LOVE the seriously sassy books - can't wait to get my hands on this one!!!!!!!!!!!! I really need to read a Gibson book!